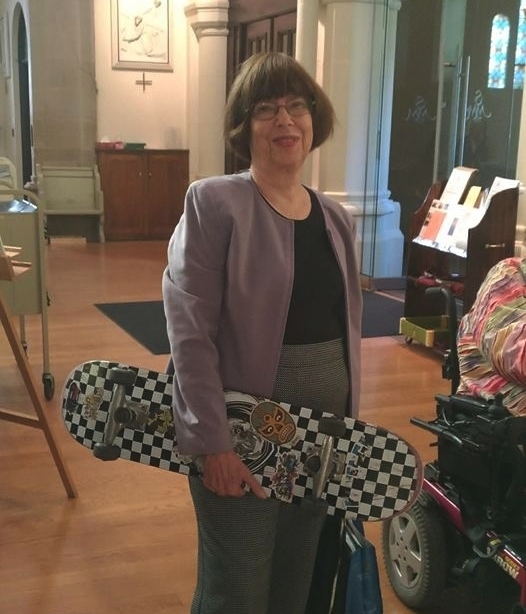 This recent photo rather says it all - the setting where I have spent a lot of my volunteer time - the connection with a grandson who arrived at the parish church on the skateboard and then forgot it when he ran off to grab a snack - and the attempt to be digitally cool. I first turned on a PC in 1984 when I was executive director of a provincial service organization with 500 organizational members and about as many individual ones. The PC saved my life. By 1990, I was happily chatting away on the Compuserve Creativity and Marketing Forums and they changed my life in other profound ways too. That connection allowed me to meet and talk to authors and famous people and ask their advice. In 1991 one son asked, "Been on the Web yet?" I traced another son through an interface to his graduate English Department at Carnegie Mellon and remember how exciting it was to find his mailbox. My first website was published in 1996. It was one page of text and on a server somewhere in western Canada. The company went broke early on but the site survived with its copy to become front page news in a national paper - by that time with the wrong address and wrong company name. I started a business site called Dynamic Thinking that I developed using MS FrontPage. By putting "business creativity" into the keyword coding, I ended up with an all expenses trip to South Africa as a keynote speaker, because an intern in Paris found me on the net when she typed those words into Google or Explorer. Along the way I published a book called See What You Think that I sold and marketed along with another product or two online. It started as a blog using Blogger and I later created business and personal websites, a site for my former residential complex, one for a small concert series - and now this one to take advantage of new design options provided by Squarespace. And of course there is Facebooking and Twittering and occasionally putting something on Medium and YouTube or Slideshare. The possibilities of creating slideshows, and photos and videos from my Iphone are wonderful. It's been a long journey from editing the high school yearbook to moving to a new platform at this age and stage - 81 as I write this. It has been - and still is - a really interesting time to be alive. Virtual worlds have widened mine and broadened opportunities in the real one immeasurably. Like any world, modern life can bring joy, innovation, suffering and peril. I'll try to keep focusing on the first two.